Looking for a picture perfect corner of Sicily with amazing food, great nature and easy access to some of Sicily’s most famous sites? Discover Scopello, small gem in the North of Sicily. ‘Would you like to come to my wedding? It is this summer, in Scopello (Sicily).’ It is with this lovely sentence that, a few months ago, I got invited to the wedding of a friend of mine I met here in Ireland. 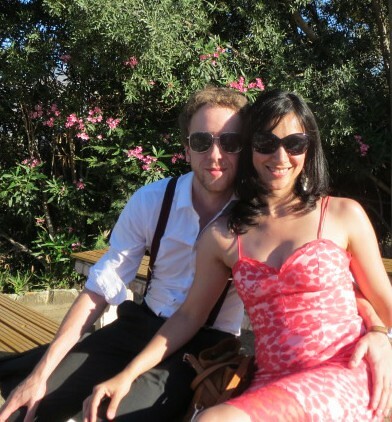 The informal tone of the invite is typical of the kind of relationship that I have with her, but it also hid a bit of a worry: that I might find a trip to Sicily with kids in tow to a formal event a bit hard to handle. Of course, she should have known better: I am not one to shy away from packing up the family and jetting off, so in the space of a few minutes I had confirmed attendance and started planning our Sicilian travel adventure! I was not the only one excited about going to Scopello: when she heard of our Sicilian escape, my mom decided to join us with a friend so the trip became multi-generational: ages covered went from 2 to over 70! Scopello proved a hit with everyone and this put if firmly on my list of recommended destinations in Sicily. When I first heard of Scopello I must admit I have no idea where in Sicily to place it. I went all self deprecation on it, thinking I should know better however, I soon discovered that Scopello it is a small village of just 80 inhabitants! It is located in the North-Western part of Sicily, and sits in between the cities of Palermo, to its East, and Trapani, to its West. Scopello is perched on a small hill and it overlooks the beautiful Riserva dello Zingaro, a long stretch of unspoiled land famous for its natural diversity and beautiful little coves. I also learned that while Scopello had been known as a holiday destination for Italian tourism for many years, it recently acquired international fame with movie stars and directors, having been the set for the movie Ocean Twelve. Wow, Scopello promised to be pretty spectacular. Scopello itself, like many other villages in Sicily, was originally built as a baglio, a word used to describe Sicilian gated rural constructions that were used as Manors belonging to barons or the church. Il baglio di Scopello dates back to the XV century and today is a beautiful piazza, surrounded by high walls and shaded by luscious vegetation, dotted with cafes, restaurants and craft shops. 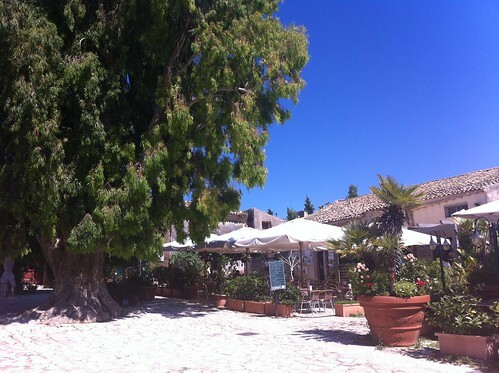 We sat in the shade of the big tree, and after a first coffee (we had more coffee in that weekend that I am prepared to admit), and a massive cone of gelato for the kids, we set out for a walk outside the baglio. Outside the walled square is where the village is most authentic: Scopello is only made up of a few lanes and sightseeing won’t take more than few minutes, but it’s a charming little place, with lots of unexpected corners from where to get a peek at the beautiful Mediterranean below. It is the perfect destination for a family holiday and one I would recommend to anyone looking for family vacation ideas in Italy. The village is mostly pedestrianised and the only cars admitted are for access to the various hotels, so most of the streets there are taken over by the local cafes, which use the street as impromptu terraces for their clients. In Scopello there is no sightseeing to be done as such, so after our walk we decided to sit in the shade of what turned out to be one of the best finds of the day: il forno (the bakery)! The bakery is a small shop with a shady terrace just on its doorstep. It is an unpretentious little shop and it’s worth stopping there to taste local specialities such as pane cunzato, bread with olive oil, tomato, cheese and anchovies and sfincione, a type of focaccia with tomatoes, onions and yet again anchovies, one of the staples of Sicilian cuisine. We went there with my mother, her friend and our two children and we all polished off every last crumb… I can certainly say the bakery catered very well for 3 different generations. After a lazy lunch there, we got some rest with the kids but the wedding party headed to one of the most beautiful parts of Scopello, la tonnara. La tonnara is an old tuna fishery that is now preserved for its historical value and is used as a charming setting for private events. The tonnara is a fabulous spot and the closest access to the sea from Scopello: its only drawback is that the access is not very easy (the path is not ideal if you have small children or you are unstable on your feet) so we had to miss out on that, despite the amazing comments of all our friends who went there to take a dip in the blue sea behind it. Unable to reach the beach, we instead went to visit the church that was about to host the wedding and found a lovely surprise. 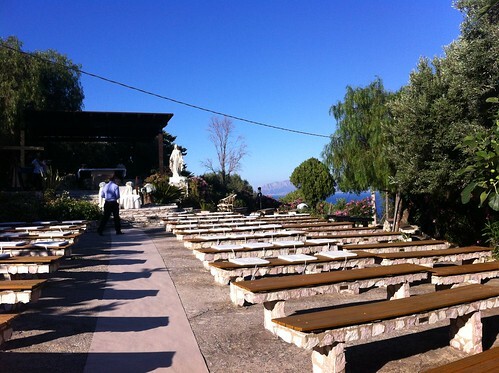 This is the open church of Scopello. Here, in the summer, you can see weddings: you don’t need to know the bride to admire her – just join the rest of the village and observe from the sidelines! The ‘church’ is only a few steps outside the village, in front of the main parking, but you may miss it if you don’t know it’s there and it’s worth a stop. 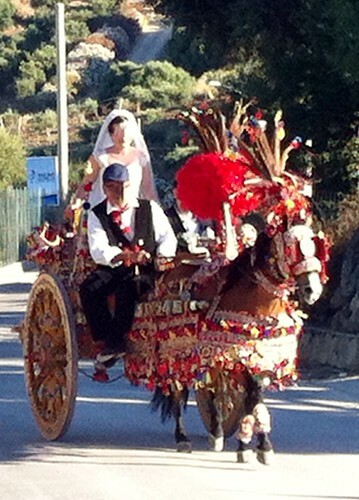 Especially if you are in Scopello when there is a wedding on, I would highly recommend you take a minute to have a peek inside and wait for the bride (the whole village will be doing the same anyway): if you’re lucky, you might see her arrive on something like this! This is us, very happy to be in such a beautiful place. Where to stay in Scopello: plenty of options, with an array of B&B, hotels and self-catering rentals to choose from. English is not widely spoken but most places use online booking services such as booking.com to make reservations easy and some establishments do have websites in English. We stayed at ‘Bagli di Scopello‘ which was, while not exceptionally charming, comfortable, clean and with the added advantage of a family friendly pool suitable also for babies and toddlers. Please note: this post contains affiliate links, which means if you click on them and make a purchase, I will receive a small commission at no extra cost to you.